It is natural for a man to thrist after strength. The other day I had some business at the Hombu Dojo and went there taking several of my students. There we listened to a talk given by Koetsu (Kisshomaru Ueshiba) Sensei. He made the following remark during his speech: “Nowadays, the streets are well protected by the police and I have almost never seen any violence. Therefore, we should disregard such notions as who is stronger or who are losers.” I thought that what he said was quite reasonable. However, on the way home my students asked me: “Sensei, did he really mean that? He may not be reading the news.” Actually, many incidents appear on the third page of the newspaper. In the old days there was a saying that, “Three years spent developing an army is all for the purpose of using it for a single day.” Although there are many soldiers, they are to be used only for emergency situations and are not usually needed. In other ways, this saying signifies that “bu” or martial arts serve as a precaution. We must of course go beyond fighting. But if young people overemphasize this idea and believe that armed forces are no longer needed because there is no need to attack anyone, this attitude presents a problem. Most of the time youngsters come to the dojo wanting to become strong. I came to study under Ueshiba Sensei for the same reason. 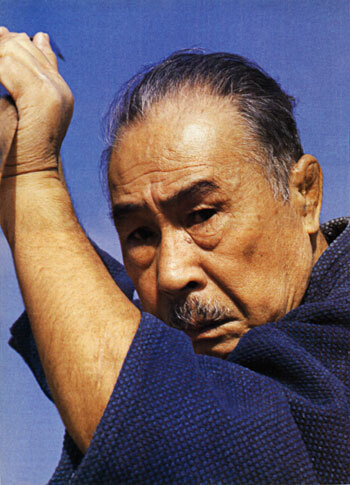 If Ueshiba Sensei were a weak-looking man who appeared as if he would fall if I swept his leg from underneath him I wouldn’t have followed him. I was very vigorous then because at the time I used to appear in championship judo tournaments. But he grabbed hold of me and flung me around as if I were insignificant. 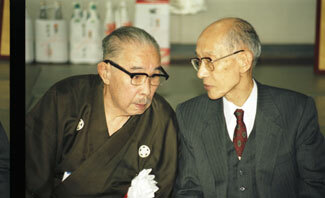 Ueshiba Sensei was great and I was surprised. After all, I thirsted after strength in those days. So I don’t think we should deny the existence of this type of desire. We should take a hard look at reality. Budo are not sports. They are traditional martial arts and an instrument of war. We must be prepared for emergencies, in a spiritual sense, I mean. Budo cultivates this spirit.